Check the exhaust control valve actuator (1) for its smooth movement when the ignition switch is turned on. 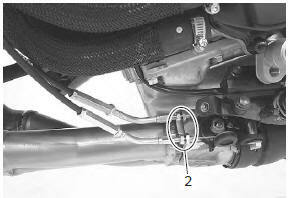 If the exhaust valve actuator does not move smoothly, check exhaust valve actuator electrical circuit. Refer to “excva inspection” in section 1k . Check the lock-nuts (2) for tightness. If the lock-nuts (2) are loose, tighten them after adjusting the cable length. Refer to “excv cable removal and installation” in section 1k .